Learn effective self-defense techniques to prevail in violent assaults and make it home in one piece. Wim Demeere teaches you everything you need to know to survive the mean streets in six hard-core DVDs divided into three sets. Every set contains two DVDs, making a total of almost four hours of hard-hitting instruction per set. They break down into specific topics, covering every aspect you need to master this brutally effective fighting system. 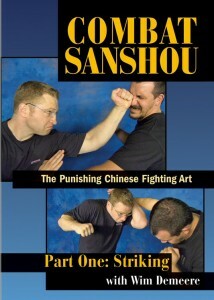 In this first set Demeere covers the basics of Combat Sanshou: Street-savvy strategies and tactics, footwork and striking techniques using the hand or fist in numerous ways, forearms and elbow techniques. He also covers several ways to defend against such attacks. This second set is an in-depth study of the use of the legs in a violent encounter. Learn devastating kicking techniques in all ranges, using both the feet and knees, without compromising your balance. These aren’t the tournament techniques you learn in other videos; this set is all about aggressively using your lower limbs to punish any aggressor into defeat. 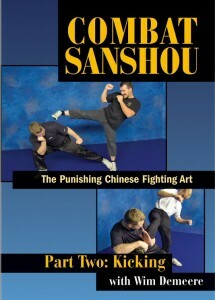 In this final set Demeere shows the moves that make Combat Sanshou such a fearsome art: Brutal throws and takedowns that damage the opponent as he falls to the ground while you stay on your feet. If you do end up there, he shows you vicious techniques to get out of the ground fighter’s realm. In the final section Demeere teaches numerous finishing moves that ensure your opponent stays down once you put him there.